Siemens approached OgilvyAction with a task to create a stunning symbol of the brand’s achievements in the technology field. The icon was to be developed to represent Siemens at COP 17 (the United Nations Framework Convention on Climate Change (UNFCCC )) last year, and the agency’s creative team decided to develop an installation that would reflect both Siemens’ style and the cultural background of the location, where the Convention was held, Durban in South Africa. 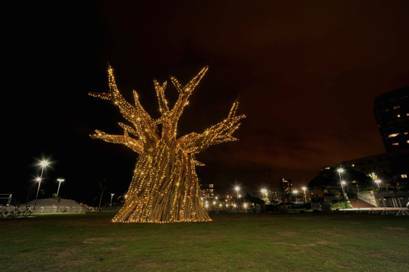 The result was an impressive 15-meter tall Baobab Tree, which was produced from reclaimed materials—metal and wood pieces. The project was designed to encapsulate the company’s key message, ‘Enough for all for generations to come’ and engage public in a new and technological way. The ‘Tree of Life,’ designed by South African constructionist Daniel Popper, was to communicate the idea that Siemens had managed to become a technology solutions leader in the renewable energy niche and a proven catalyst for hope and action on a global scale. The unconventional installation, which was delivered to the location in parts and then put together (the construction process took four weeks), served as an unofficial broadcast point for media outlets since both local and international reporters used the tree, decorated with numerous lights, as a backdrop for their video reports. The creative decision to make the baobab look like a Christmas tree most probably inspired by the fact that COP 17 was hosted from November 28 through December 9, the time when Christmas season usually starts. To generate buzz around the sustainable tree installation, a special hashtag (#mycommitment) was introduced. Over 10,600 tweets featuring the hashtag was posted to the micro-blogging website during the campaign, and 30,170 visited the giant mind-blowing giant artwork. Posted in Case Studies and tagged art project, case, creativity, culture, international, Siemens, technology. Bookmark the permalink.